Random White are a four-piece from Manchester that we recently caught at the Eagle Inn in Salford. Impresssed, we got talking to guitarist Lloyd Jones after the show to find out more about them, how they get together, what you should be listening to and their gig-heavy plans for 2015. Could you introduce the band please? 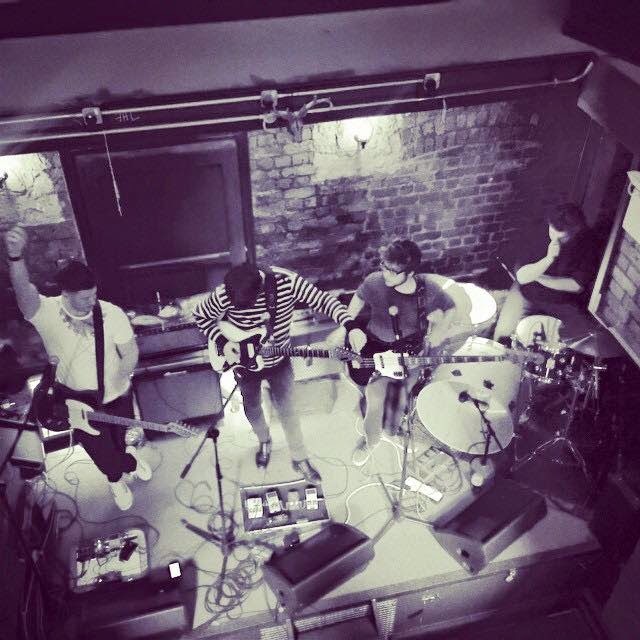 We are Random White a four piece indie rock n roll band based in Manchester. There’s Sam on guitar and vocals, Lloyd on guitar, Matt on bass and Sion on drums. How did you get together and how long have you been going? We got together in 2013. I moved up to Manchester from North Wales early that year and started jamming and writing tunes with Sam who I knew from back home. I got in touch with my cousin Sion who was also living in Manchester to see if he fancied getting together for a jam so all three of us started playing the few tunes we had. Sam advertised online for a bassist and I think Matt was the first guy who came to see us, he slotted in straight away from the start, we all got on with him and musically he was a perfect fit. If you had to describe your sound to someone where would you start? Our sound is energetic, melodic and riff driven. Being a two guitar band we think it’s important to have both guitar parts working independently of each other to create a song, rather than both guitars strumming the same chords. We’re big fans of bands like The Pixies and Joy Division who use the bass as a focal part of songs, rather than just following what the guitars are doing. I think unconsciously we have written songs that do the same so I’d say you can hear those influences in our music. We’re an indie band but our drummer Sion listens to and plays a variety of genres including heavier music than perhaps the others do, so the drums are a driving force in the band, we couldn’t write the songs we do or play them the way we do without his influence. He’s not just at the back keeping time. It’s hard to say any bands we sound like but we’re all influenced by so many different bands, which I think compliments us. Obviously we love all the usual suspects, but people would probably hear The Replacements, The Libertines, The Cribs and the Horrors in our sound. If you had to pick a song that best summed up the band, what would you choose and why? It’s hard to choose just one, so I’ll cop out and go for two! Back is probably a signature song of ours in that it’s bass driven with a heavy drum beat with riffing guitars over the top, it’s loud, fast, energetic and punchy it needs to be played loud and while I love the recording, the song needs to be played and seen live to be fully appreciated. The second song I’d pick would be Same As It Ever Was. It’s a more melodic song and shows that we’re capable of writing more subtle tunes than some of the others. It’s noticeably a Random White song as it’s got the big bass lines working with the drums and independent guitar riffs. The main thing for us this year is to get out and gig as often as possible, but to make sure we’re playing the right gigs too. We spent last year getting experience playing this batch of songs live and making contacts in the Manchester scene and are busy in the early part of the year in and around Manchester. We’re looking to get our music out there by getting it onto as many radio stations as possible. Playing outside Manchester in the Northwest and further afield is something we want to start doing once we've finished our local dates, which will be after Easter. Modern White are on Facebook, Twitter and Soundcloud.